View cart “Amanush” has been added to your cart. 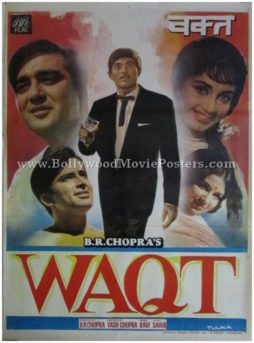 Old Bollywood poster for sale of the blockbuster hit Hindi film, Waqt (1965). This is an actual surviving old Bollywood poster for sale of the 1965 Hindi film that was produced by B. R. Chopra and directed by Yash Chopra. Waqt is credited with pioneering the concept of multi star casts in Indian cinema. It’s ensemble cast included the likes of Sunil Dutt, Raaj Kumar, Shashi Kapoor, Sadhana, Balraj Sahni, Madan Puri, Sharmila Tagore, Achala Sachdev and Rehman. The film bagged several awards, most notable of them including the Filmfare Best Director Award (Yash Chopra) and the Filmfare Best Supporting Actor Award (Raaj Kumar). Waqt was shortlisted by the BFI in their list of films to consider for the top ten Indian films award, making this old Bollywood poster highly collectible! This old Bollywood poster was designed and printed for publicity of the film a few years after its original first release (somewhere in the late 1960s). This old Bollywood poster features an interesting collage of still images of the lead cast. Actor Raaj Kumar is seen at the center of this Waqt movie poster flanked by Sunil Dutt and Sadhana on either side. Shashi Kapoor and Sharmila Tagore are seen in smaller photographic stills at the bottom of this Waqt movie poster. Waqt (1965) rekindled the age old lost-and-reunited formula that had been continuing since the early 1940s in Bollywood (first used in Kismat that released in 1943). The film is fondly remembered for its iconic song, “Ae Meri Zohra Jabeen,” sung by Manna Dey which is played till today. 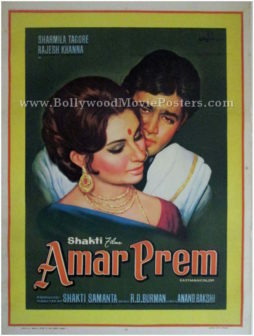 Old Bollywood poster for sale of the super hit Hindi film, Amar Prem (1972). This is an actual surviving vintage Bollywood poster of the 1972 Hindi film directed by Shakti Samanta starring Sharmila Tagore and Rajesh Khanna in lead roles. After delivering two back to back hits – Aradhana (1969) and Kati Patang (1971) – Shakti Samanta achieved a hat trick of hits with Amar Prem’s release in 1972. The film became his third consecutive blockbuster to star Bollywood’s original superstar, Rajesh Khanna. Rajesh Khanna’s epic dialogue, “Pushpa, I hate tears,” which appeared five times in the film, went on to become one of the most memorable dialogues of Indian cinema and has been parodied several times over the years. The film went on to receive several awards and nominations. At the 1973 Filmfare Awards, Amar Prem won the award for Best Screenplay, Best Dialogues, and Best Sound, making this old Bollywood poster highly collectible! 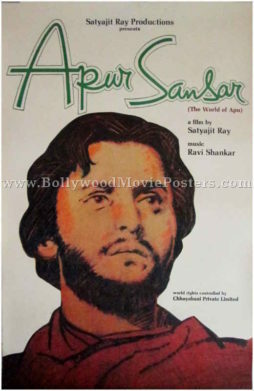 Printed and circulated during the debut release of the film (early 1970s), this old Bollywood poster was originally designed for publicity of the film but never ended up being used. This old Bollywood poster was originally hand painted on canvas by one of the greatest Bollywood poster artists of all time, DR Bhosle and bears his printed signature on the top right hand corner. DR Bhosle’s distinct style of minimalism is clearly seen in this old Bollywood poster for sale. The poster features a stunning hand painted portrait of the lead couple in a passionate pose. A plain green background with a yellow border further highlights the minimalism in the design of this original Bollywood movie poster. Amar Prem is fondly remembered for it timeless music composed by Bollywood’s greatest music director, R. D. Burman. Songs like “Chingari Koi Bhadke,” “Yeh Kya Hua, Kaise Hua, Kab Hua” and “Kuch Toh Log Kahenge” sung by Kishore Kumar are played till today. Extremely rare vintage Satyajit Ray movie poster of one of the finest films ever made in Bengali cinema, Devi (1960) for sale. Written and directed by master filmmaker Satyajit Ray, Devi is a Bengali drama that starred Soumitra Chatterjee and Sharmila Tagore in lead roles. Based on a short story by Provatkumar Mukhopadhyay, Devi won the prestigious President's Silver Medal for Best Feature Film in Bengali at the 1960 National Film Awards. It also received a Golden Palm nomination at the Cannes Film Festival in 1962, making this rare Satyajit Ray movie poster highly collectible! Printed and circulated during the debut release of the film (somewhere in the early 1960s), this is one of the rarest Satyajit Ray film posters for sale that one can buy. This is an actual surviving vintage Bollywood poster for sale of the 1965 Hindi film that was produced by B. R. Chopra and directed by Yash Chopra. The film bagged several awards, most notable of them including the Filmfare Best Director Award (Yash Chopra) and the Filmfare Best Supporting Actor Award (Raaj Kumar). Waqt was shortlisted by the BFI in their list of films to consider for the top ten Indian films award, making this vintage Bollywood poster highly collectible! This vintage Bollywood poster was designed and printed for publicity of the film a few years after its original first release (somewhere in the late 1960s). This old Bollywood poster for sale was originally designed in hand painted oil on canvas format by a poster art studio in Delhi called Saraswati Arts. 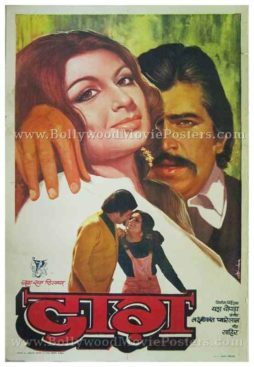 Stunning hand painted portraits of Shashi Kapoor, Raaj Kumar and Sadhana are seen on the top of this Waqt movie poster. A large close up of Sunil Dutt is seen in a brilliant hand painted rendition in the center. Smaller portraits of Sharmila Tagore and Balraj Sahni are seen below. 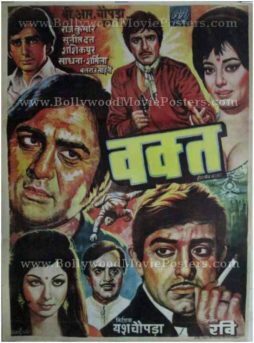 A large close up of Raaj Kumar smoking a cigarette is seen on the bottom right hand corner of this Waqt movie poster. 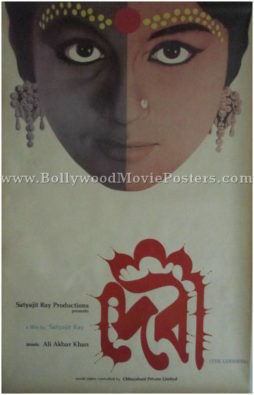 Original Bollywood movie poster for sale of the critically acclaimed old Hindi film, Swati (1986). This is an actual surviving original Bollywood film poster of the 1986 Hindi movie that starred Meenakshi Sheshadri and Sharmila Tagore in lead roles. Shashi Kapoor, Vinod Mehra, Madhuri Dixit and Sarika also played prominent roles in the film. Directed by Kranthi Kumar, Swati was a key art film in the world of Indian parallel cinema that won rave reviews from critics, making this original Bollywood movie poster, highly collectible! Printed and circulated during the initial first release of the film (in the mid 1980s), this old Bollywood poster was originally designed for publicity of the film but never ended up being used. This original Bollywood movie poster for sale features a stunning still photograph of mother and daughter, Sharmila Tagore and Meenakshi Sheshadri embracing each other in love. The background of this old Bollywood poster is painted using pleasing color tones. Old hand painted Bollywood movie poster of the blockbuster Hindi film, Daag: A Poem of Love (1973) for sale. This is an actual surviving original hand drawn Bollywood poster of the 1973 Hindi film that was produced and directed by the “King of Bollywood Romance,” Yash Chopra. Daag marked the debut of Yash Chopra as producer, laying the foundation of Yash Raj Films, making this hand painted Hindi movie poster highly collectible! The film received several nominations and got Yash Chopra the Filmfare Award for Best Director. Printed and circulated a few years after the first release run of the film (mid 1970s), this old hand painted Hindi movie poster was originally designed for publicity of the film but never ended up being used. This hand drawn Bollywood poster features stunning hand painted artwork created by one of the highest paid and most sought after Bollywood poster designers of his time, Diwakar Karkare of Studio Diwakar fame. Stunning hand painted portraits of actress Sharmila Tagore and actor Rajesh Khanna are seen in this hand drawn Bollywood poster. Originally hand painted on canvas by master Bollywood poster painter Diwakar Karkare, this vintage hand drawn movie poster bears his printed signature on the bottom right. 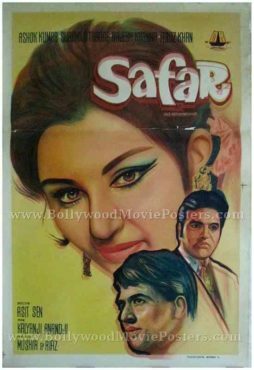 Old Bollywood poster for sale of the hit Hindi film, Safar (1970). This is an actual surviving old Bollywood movie poster of the 1970 Hindi film that featured the “Original Superstar” of Bollywood, Rajesh Khanna in the lead role. Safar is an award winning film that featured a critically acclaimed performance from Rajesh Khanna, making this poster highly collectible! Printed and circulated during the first release run of the film (early 1970s), this old Bollywood movie poster was originally designed for publicity of the film but never ended up being used. 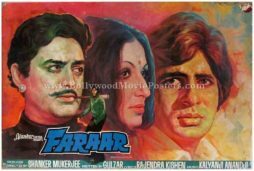 This old Bollywood movie poster features fascinating hand painted artwork. Originally hand painted on canvas by a Bollywood poster painter, this vintage Bollywood poster features portraits of the three lead stars Rajesh Khanna, Sharmila Tagore and Feroz Khan set against plain background. 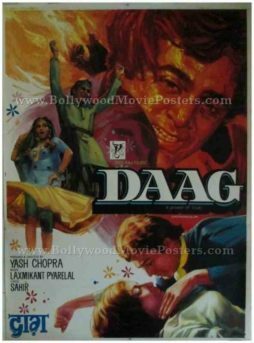 Old Bollywood movie poster of the blockbuster Hindi film, Daag: A Poem of Love (1973) for sale. This is an actual surviving original vintage Bollywood movie poster of the 1973 Hindi film that was produced and directed by the “King of Bollywood Romance,” Yash Chopra. Daag marked the debut of Yash Chopra as producer, laying the foundation of Yash Raj Films, making this poster highly collectible! Printed and circulated during the first release run of the film (early 1970s), this old hand painted Bollywood movie poster was originally designed for publicity of the film but never ended up being used. This vintage Bollywood movie poster features stunning hand painted artwork created by one of the highest paid and most sought after Bollywood poster designers of his time, Diwakar Karkare of Studio Diwakar fame. A stunning hand painted portrait of actress Sharmila Tagore is seen prominently on the poster, with Rajesh Khanna in the background. A still photo of the lead couple in a romantic pose appears pasted at the bottom. Originally hand painted on canvas by master Bollywood poster painter Diwakar Karkare, this vintage Bollywood poster bears his printed signature on the bottom right. Old Bollywood movie still photo of the hit Shakti Samanta film, Kashmir Ki Kali (1964) for sale. This is an actual surviving old Bollywood lobby card of the 1964 box office hit that featured the Elvis Presley of India, Shammi Kapoor in the lead role. Kashmir Ki Kali was the first Hindi film to star Sharmila Tagore, marking her Bollywood debut. Printed and circulated during the original first release of the film (somewhere in the early 1960s), this old Bollywood movie still photo was printed for publicity of the film. This beautiful vintage Bollywood movie lobby card was designed and printed for publicity of the film and was actually used inside a theater that screened Kashmir Ki Kali. The four corners of the lobby card feature punched holes and display visible pin hole markings – tell tale sings of being pinned on the notice board of a movie theater. This old Bollywood movie lobby card was designed by taking a still photograph from the film and mounting it on a board. 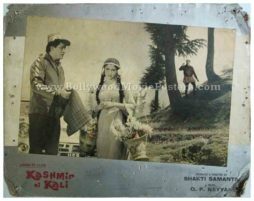 An iconic scene from the film Kashmir Ki Kali is captured in this old Bollywood movie still photo. Shammi Kapoor is seen with a very young Sharmila Tagore in the foreground while actor Pran is seen in a distance. The photograph has a beautiful vintage tint and is black and white except for the flowers, which appear in color. 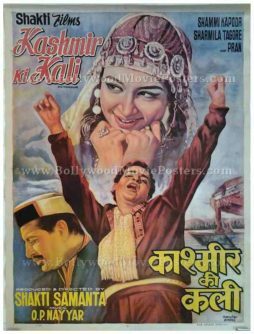 Kashmir Ki Kali is a 1964 Bollywood movie directed by Shakti Samanta, starring Shammi Kapoor and Sharmila Tagore in lead roles. The film’s memorable music was composed by O.P. Nayyar. Chartbusters from the film like “Yeh chand sa roshan chehra” and “Deewana hua badal” are played till today. Rare original vintage Bollywood movie poster of the hit Shakti Samanta film, Kashmir Ki Kali (1964) for sale. This is an actual surviving old Bollywood poster of the 1964 box office hit that featured the Elvis Presley of India, Shammi Kapoor in the lead role. Printed and circulated a few years after the first release of the film (somewhere in the early 1970s), this original Bollywood poster was produced for publicity of the film but never ended up being used. The poster was originally designed on a hand painted canvas by artist Manohar Suresh. In the poster, Shammi Kapoor appears in a dancing pose at the bottom, while Sharmila Tagore is seen wearing a traditional Kashmiri dress on the top. A side profile of Pran is seen at the bottom. The typography used in this poster is completely in English, with a translation of the title in Devanagari Hindi at the bottom. Kashmir Ki Kali is a 1964 Bollywood movie directed by Shakti Samanta, starring Shammi Kapoor and Sharmila Tagore in lead roles. The film’s memorable music was composed by O.P. Nayyar. Chartbusters from the film like Yeh chand sa roshan chehra and Deewana hua badal are played till today. Old hand painted Bollywood poster of the hit Hindi comedy Chupke Chupke (1975) for sale. 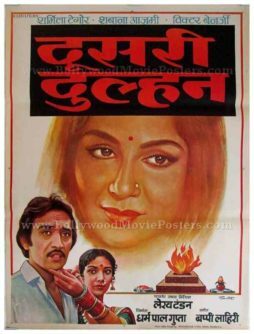 This is an actual surviving vintage Bollywood poster of the 1975 film directed by Hrishikesh Mukherjee that featured Dharmendra, Sharmila Tagore, Amitabh Bachchan and Jaya Bachchan in lead roles. Printed and circulated somewhere during the first release of the film (Mid 1970s), this old vintage Bollywood movie poster was originally designed for publicity of the film but never ended up being used. This Bollywood poster was originally designed on a hand painted canvas by one of the greatest Bollywood poster painters of all time, D.R. Bhosle, making it highly collectable. It features a very restrained and minimal design, which is typical of D.R. Bhosle’s artwork. The two leading couples are depicted in romantic poses at the top and bottom respectively. Typography appears completely in Devanagari Hindi. Chupke Chupke (1975) is a hit Bollywood comedy directed by Hrishikesh Mukherjee starring Dharmendra, Sharmila Tagore, Amitabh Bachchan, Jaya Bachchan, Om Prakash, Asrani and Keshto Mukherjee. This film is one of two released in 1975 to cast Dharmendra and Amitabh together, the other being Sholay. 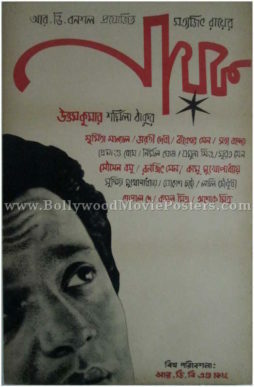 Old Indian movie poster of the classic Hindi & Bengali film, Amanush (1975) for sale. This is an actual surviving vintage publicity poster of the award winning 1975 film that featured Sharmila Tagore and Uttam Kumar in lead roles. 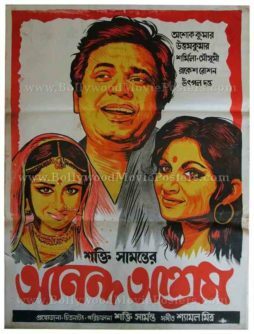 Printed and circulated a few years after the first release of the film (somewhere in the late 1970s), this old Bengali movie poster was printed for publicity of the Bengali release of the film but never ended up being used. 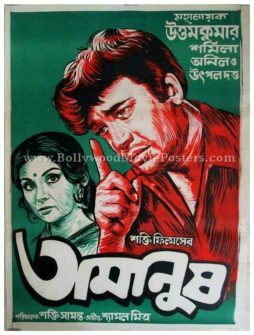 Amanush when released in Bengali, became a massive hit among the local Bengali speaking population, making this poster highly collectible. This poster was originally designed in hand painted oil on canvas format by a small time art studio in Kolkata. The design of this hand drawn old Bengali film poster captures lead actor Uttam Kumar in a large portrait whereas Sharmila Tagore appears in a smaller avatar at the bottom. Amanush is a 1975 Bollywood movie made in both Hindi and Bengali. The film starred Sharmila Tagore and Bengali superstar Uttam Kumar in lead roles and was produced and directed by Shakti Samanta. Utpal Dutt played the role of a villain in the film. Kishore Kumar sung several smashing songs for the Bengali version of Amanush, which became a rage among the Bengali speaking population of the country. The film won several awards and accolades, including the prestigious Filmfare awards. Beautiful hand drawn old Hindi film poster of the Bollywood movie Desh Premee (1982) for sale. This is an actual surviving poster of the 1982 action film that featured the biggest superstar of Indian cinema, Amitabh Bachchan in a double role. Printed and circulated somewhere during the release of the film, this vintage movie poster was originally designed for publicity of the film but never ended up being used. This poster was originally designed on a hand painted canvas by a well known art studio, Expert Eyes. It also features a black and white still photograph pasted on the bottom corner, making it a hybrid of sorts in terms of design techniques used. This movie poster has been printed on a glossy photo quality sheet, making it very collectible and extremely rare. In this old hand painted poster, the artist captures the original angry young man of Bollywood, Amitabh Bachchan, in a double role. 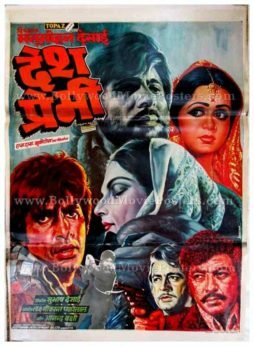 An older Amitabh appears on the center of the poster, while he is seen in a much younger avatar on the bottom left of the poster. 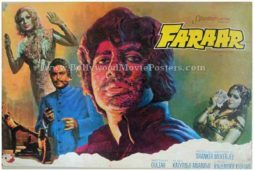 One of Bollywood’s greatest villains, Amjad Khan is seen in a superbly accurate hand painted avatar holding a pistol at the bottom. Amjad Khan’s portrait has been painted in red, presumably to reflect the tone of anger in his character. The typography used in this poster is entirely in Devanagari Hindi. The title, Desh Premee appears on the poster in almost a 3D like font. 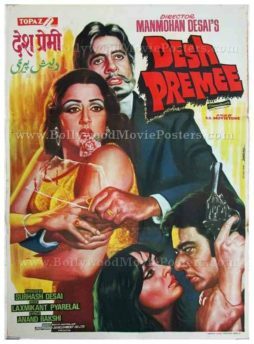 Desh Premee (The Patriot) is a 1982 Hindi film directed by Manmohan Desai starring the greatest superstar in Bollywood, Amitabh Bachchan in a double role. Legendary Bollywood singer Mohammed Rafi who sang the film’s title song and actor Uttam Kumar passed away two years before the film was released. As such, the film was dedicated to both of them. Desh Premee is the only Bollywood film in which music director Laxmikant sang a song. Beautiful hand painted Bollywood movie poster of the Hindi film Desh Premee (1982) for sale. This is an actual surviving vintage poster of the 1982 action film that featured the biggest superstar of Indian cinema, Amitabh Bachchan in a double role. Printed and circulated somewhere during the release of the film, this vintage movie poster was originally designed for publicity of the film but never ended up being used. This old Amitabh poster was originally designed on a hand painted canvas by a well known art studio, Expert Eyes. In the poster, the artist captures the original angry young man of Bollywood, Amitabh Bachchan, in an older avatar. He is seen holding Dream Girl Hema Malini in his arms while wielding a broken piece of glass. The transparency of the glass has been recreated to accurate detail – making it appear almost photographic. Actor Navin Nischol is seen holding a pistol in a much smaller avatar at the bottom along with a very seductive portrait of glamor queen Parveen Babi, highlighted by a pout on her lips. The typography used in this poster is primarily in English, with only the title translated in Devanagari Hindi as well as Urdu on the top left. The title, Desh Premee appears on the poster in almost a 3D like font. Beautiful hand painted vintage Bollywood movie poster of the blockbuster Hindi film, Aradhana (1969) for sale. Aradhana is responsible for catapulting Rajesh Khanna to success and turning him into an overnight sensation. This is the film that gave birth to the First Superstar of Hindi Cinema, making the poster highly collectible. This is an actual surviving vintage poster of the 1969 romantic film that featured Rajesh Khanna, also referred to as the first or original superstar of Bollywood. In total, Rajesh Khanna appeared in over 100 movies as lead hero – an unbeatable record in Bollywood. Printed and circulated during the release of the film in the late 1970s, this vintage movie poster was originally designed for publicity of the film but never ended up being used. This poster was originally designed on a hand painted canvas by one of the most sough after Bollywood poster designers, C. Mohan. Aradhana is one of the best simplistic hand painted Bollywood movie posters ever designed, and is highly collectible. Poster artist C. Mohan chooses a very simplistic approach to capture the chemistry between the lead couple of the film, as evident by the plain white background. The focus is entirely on the hand painted portraits of the stars Rajesh Khanna and Sharmila Tagore. The two appear with their eyes closed deeply in love. Simple flowers are used to accentuate the poster and lend it a romantic aura. Artist C. Mohan’s original signature appears on the bottom left of the poster. The typography used in this poster is completely in Devanagari Hindi. Aradhana was declared best film of the year by Filmfare Awards. Sharmila Tagore won her first Filmfare Best Actress Award for the same role that won Olivia de Havilland her first Academy Award for Best Actress. The Film was a blockbuster at the box office becoming the highest grosser of 1969. Originally released in Hindi and dubbed in Bengali, Aradhana’s huge success led to two subsequent remakes being made in Telugu and Tamil. The soundtrack of the film has been composed by the greatest Bollywood music composer of all time, S. D. Burman, with lyrics by Anand Bakshi. It is believed that SD Burman became ill midway while composing music for the film, and his son R. D. Burman took over. RD Burman decided to use Kishore Kumar for the songs “Roop Tera Mastana” and “Mere Sapno Ki Rani” both of which turned into blockbuster hits and are played till today. Another track from the film, “Kora Kagaz Tha Yeh Man Mera” sung by Kishore Kumar & Lata Mangeshkar became a rage throughout the nation. Hand painted old Bollywood poster of the Hindi film Anand Ashram (1977) for sale. This is an actual surviving vintage poster of the 1977 Bollywood movie that was made in dual languages – Hindi as well as Bengali. Starring actress Sharmila Tagore, this poster was printed and circulated somewhere during the first release of the Hindi version of the film. This hand painted old Bollywood poster was originally designed for publicity of the film but never ended up being used. The poster was originally designed on a hand painted canvas by one of the greatest Bollywood movie poster designers in history, D.R. Bhosle, making it very collectable. D.R. Bhosle has chosen a very simplistic approach in hand painting this poster, as seen by the large and highly realistic portraits of Uttam Kumar, Sharmila Tagore and Ashok Kumar. Poster artist D.R. Bhosle’s original signature is found on the top left hand corner of the poster. The typography used in this poster is both in English as well as Devanagari Hindi. Anand Ashram is a 1977 Bollywood film which was released in both Hindi as well as and Bengali. Written and directed by Shakti Samanta, the film is based on a story by Bengali film director and novelist, Sailajananda Mukhopadhyay. It starred Ashok Kumar, Uttam Kumar and Sharmila Tagore in lead roles. Samanta had previously made another dual language version called Amanush (1975) with the same lead actors. Quirky, hand painted old Bengali poster of the film Anand Ashram (1977) for sale. This is an actual surviving old poster of the 1977 Bollywood movie that was made in dual languages – Hindi as well as Bengali. Starring actress Sharmila Tagore, this old poster was printed and circulated somewhere during the release of the Bengali version of the film. This quirky, hand painted old Bengali movie poster was originally designed for publicity of the film but never ended up being used. The poster was originally designed on a hand painted canvas by a small time art studio in Kolkata, making it very collectable. It features a large, quirky hand drawn portrait of the lead actor Uttam Kumar on the top, with smaller portraits of the two actresses Sharmila Tagore and Moushumi Chatterjee on the bottom. The entire poster is designed and printed in two primary colors, i.e. yellow and red, adding greatly to its quirk quotient. The typography used in this poster is entirely in Bengali.